RPT-1 Nova Repeater, Delay/Echo/Phrase Sampler for Guitar from TC Electronic in the Nova series. Nova Repeater features six delays types, mono in and stereo out, a dedicated tap-tempo switch, audio tapping and a 'Killdry' switch. It also sports a handy multi-function pot, designed to enable you to personalise your sound with a range of chorus and vibrato effects — great for U2-style ethereal effects or the emulation of tape wow and flutter, according to TC Electronic. Nova Repeater has two inputs matched for instrument and line level signals. In other words, Nova Repeater works in front of an amp or in an effects loop. The Nova Repeater delay retails at USD 149.99 excl. VAT and will ship starting April 2009. 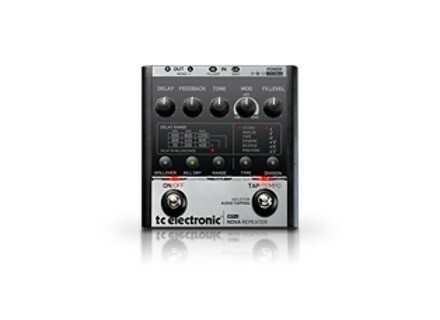 Check out www.tcelectronic.com for more info. Mel Bay Western Swing Lead Guitar Styles Book and CD Mel Bay Publications presents Western Swing Lead Guitar Styles by Joe Carr. Basone Guitars Phoenix Basone Guitars has released more variations of its newlatest line of products, the Phoenix series. Mel Bay School of Country Guitar: Chords, Accompaniment, Styles, Basic Leads Boo Mel Bay Publications presents School of Country Guitar: Chords, Accompaniment, Styles, Basic Leads by Joe Carr.